In the UK, macadam sports court are very popular sports facilities at schools, clubs and other outdoor sports centres. 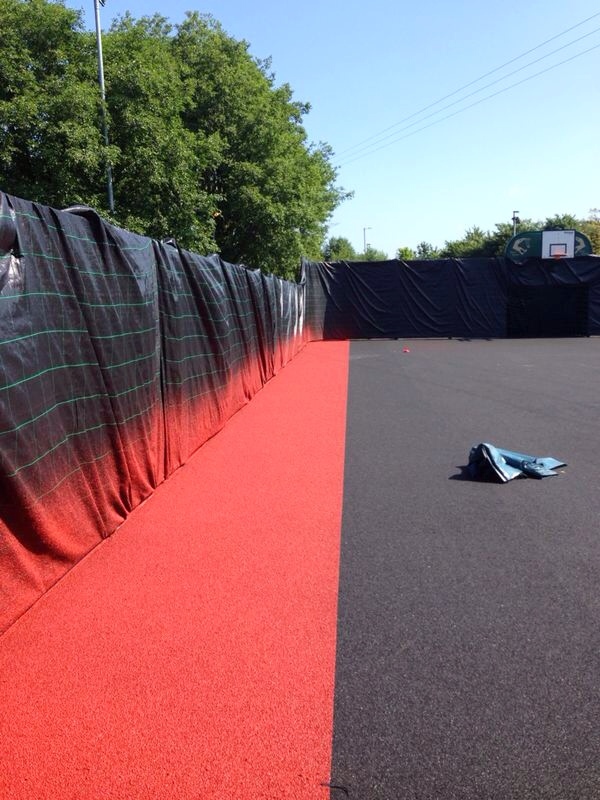 The strong and durable surfacing is ideal for use with a multitude of sports including basketball, tennis and netball. 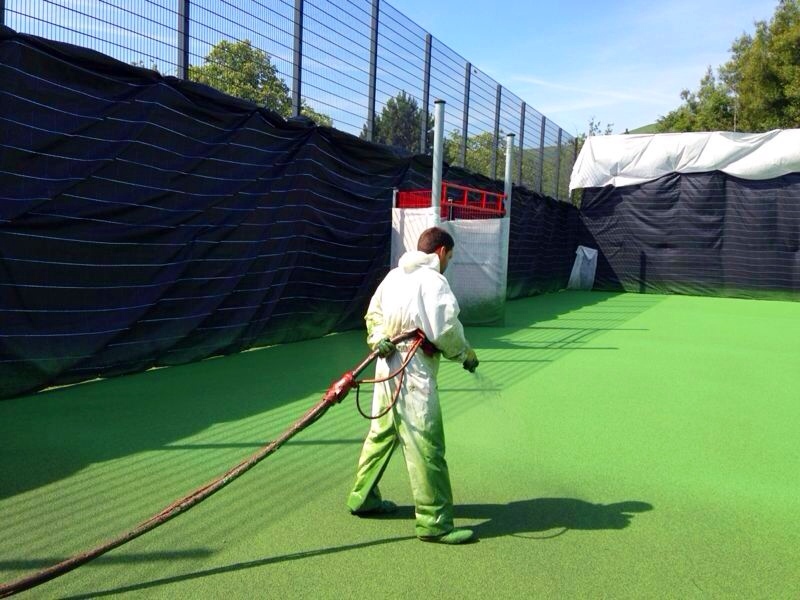 However, over time macadam surfaces can become worn out if they’re not looked after properly and they get a lot of heavy use, this is where the sports surface may be in need of a waterbase court binder and aggregate rich acrylic spray-cote application. Having this process carried out by a professional sports court contractor will improve the appearance of your macadam surface as well as restoring the original performance qualities. When you have a tired and worn out macadam sports surface, the application of a waterbase court binder can improve the appearance and repair minor damage such as fretting and cracks to the surface. When applied to an existing tarmac surface, a waterbase court binder creates excellent adhesion to bind the stone aggregate of the macadam surface together and improve the durability of the court. The specialist court binder coat can be applied as a base layer for an aggregate rich acrylic spray-cote on an existing damaged sports court. This should only be done after a thorough clean of the sports surface has been carried out to ensure that no dirt or debris will stop the binder from sticking properly to the macadam surface. A waterbase court binder is also sometimes applied to brand new sports courts that are in heavily shaded areas which are prone to being damp. The binder can prevent the growth of moss and algae which thrive in these types of damp conditions especially if there is dirt and organic matter stuck to the surface. After a specialist sports court binder has been applied to smooth out the tired macadam surface, a new application of aggregate rich acrylic spray-cote can be put down. The specially designed acrylic paint is mixed into a solution with a combination of sand and aluminium oxide to create slip resistance. Different amounts of these materials can be added to the mixture to create different slip resistance levels for the sports which are going to be played on the court. For example a court which is primarily used for netball would need higher anti slip properties than one used mostly for tennis. The aggregate rich acrylic spray-cote can be applied in a range of bright colours with multi-sport line markings in contrasting designs to make the facility suitable for all purposes. The combination of a waterbase court binder application with a fresh layer of aggregate rich spray-cote will prolong the life of a macadam sports court and greatly improve the look and performance of the facility. However if the the sports surface is fretting a lot and the macadam breaks up easily through pressure washing, it’s likely that a binder coat and new paint will not be enough to fix the problem. This is where a full sports court resurface may be the only way to restore the facility back to its top playing qualities. If you’ve got a macadam sports court that’s looking tired and starting to develop fretting, get in touch with us to discuss the application of a court binder and fresh coat of acrylic paint to bring it back to life. 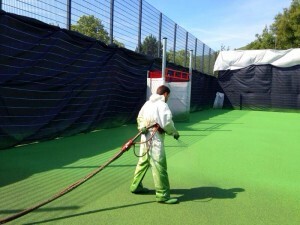 You can visit our website at https://www.sportsandsafetysurfaces.co.uk/ for more information on the sports facility services we offer. Please fill in our contact form if you want to speak to a member of our experienced staff with regards to any questions you have about waterbase court binder and aggregate rich acrylic spray-cote. We’d be happy to offer you some friendly advice as well as a price quotation to carry out these works for your sports court.